Measurement today is evolving from technology that counts site traffic into a broader system that measures your effectiveness in advertising, sales, product usage, support, and retention. Ultimately, this sort of integrated measurement can help you deliver the best service, products, and experiences for your customers. We’ve been developing solutions, like Google Analytics Premium and Mobile App Analytics to advance this vision. For large enterprises, such as Premium customers and those who want to work with APIs, we're now starting to offer “Universal Analytics.” This will help these customers tailor Google Analytics to their needs, integrate their own datasets and ultimately get a more complete vision of the entire marketing funnel. Mastering data on your website is no longer sufficient - larger clients are increasingly asking for a cross platform view of their data in Analytics. The tools from the Measurement Protocol allow you to seamlessly send your own data about your customers and business (from any digital device that you are measuring) to your Analytics account. This can help you see how users interact with your brand from multiple touchpoints - phones, tablets, laptops or more - in one place. We announced Mobile App Analytics at I/O in 2012 as a beta. It’s been delivering great results for clients. Universal Analytics now enables you to measure your marketing more holistically by integrating this data with your Google Analytics account. Cross-channel information is more important and more diverse than ever before. Universal Analytics, via the Measurement Protocol, lets you sync your own data from across various marketing channels, so you can discover relationships between the channels that drive conversions. Not every campaign (or app, or website!) is the same, and sometimes, depending on your business and goals, you want to learn more about a particular aspect of the way visitors interact with your business. With Universal Analytics, you can integrate your own data and can customize the metrics that matter to you - beyond website visits. Google Analytics can deliver the custom metrics you want, in the same report you’re used to, based on the customized data you provide. 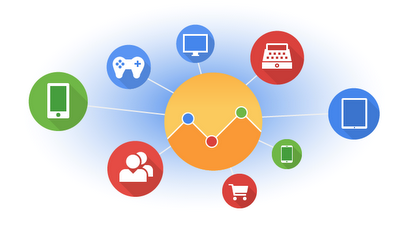 As a Google Analytics user, Universal Analytics won’t mean any changes in your account. But if you’re a large enterprise that is interested in exploring the integration options, you can learn about getting started in our help center. A typical consumer today uses multiple devices to surf the web and interact in many ways with your business. For most large businesses, already swimming in many sources of hashed data, it’s an enormous challenge, but also an incredible opportunity.